BRS Secretariat staff are contributing to the Global Symposium on Soil Pollution, at FAO headquarters from 2 to 4 May 2018, co-organised by the UN Food and Agriculture Organization and its Global Soil Partnership (GSP), the Intergovernmental Technical Panel on Soils (ITPS), BRS Secretariat, UN Environment and the World Health Organization (WHO). The event is seen as a common platform to discuss and elaborate the latest information on the status, trends and actions (both scientific and political) on soil pollution and its threatful consequences on human health, food safety and the environment. According to BRS Executive Secretary, Rolph Payet, “the Symposium comes at an opportune time when more and more soils are being polluted. In response, the international community is strengthening its commitments to beat pollution, implement sound management of chemicals and wastes, tackle climate change, and work towards zero hunger”. 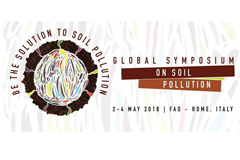 For more information on the Symposium please contact BRS Programme Officer Melisa Lim melisa.lim@brsmeas.org or consult the event website at http://www.fao.org/about/meetings/global-symposium-on-soil-pollution/en/.